It goes without saying that I have a great appreciation for Francis Ford Coppola’s Godfather trilogy. Except for Godfather III, which doesn’t really count. But let’s not get into that. If Godfather I or Godfather II is on TV, it’s a safe bet that I’ll drop what I’m doing to watch. “Luca Brasi sleeps with the fishes” is one of the most quoted movie lines of all time. While nobody would choose to die the violent way Luca Brasi did, burial at sea is a custom that’s been around for centuries. Even today, the scattering of cremated remains (known as “cremains”) at sea is quite common. But I’m not going to talk about that. It’s burial at sea of a body that’s much rarer and also more complicated. 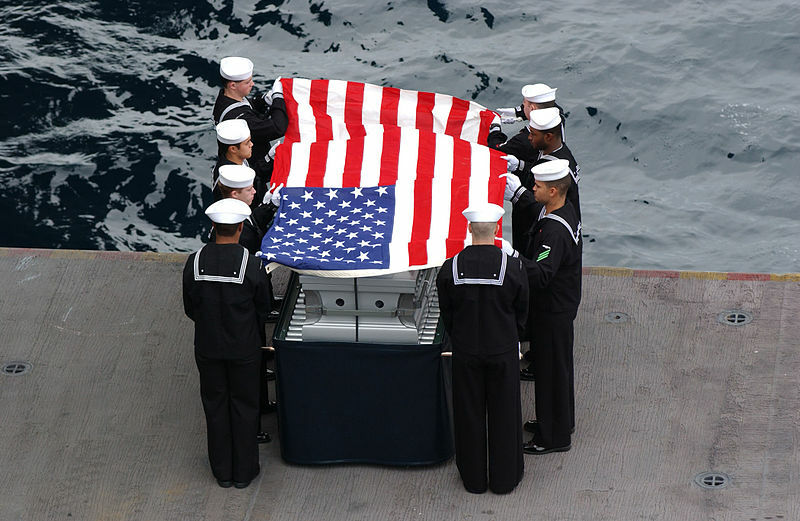 In our corner of the world, the U.S. Navy does the lion’s share of burials at sea. One of the most noted and recent was the burial of Osama Bin Laden on the aircraft carrier USS Carl Vinson. According to the Pentagon, in accordance with Islamic practices, his body was wrapped in a clean, white sheet. It was then sealed inside a weighted bag, placed on a board and tilted so it would slide into the Arabian Sea. 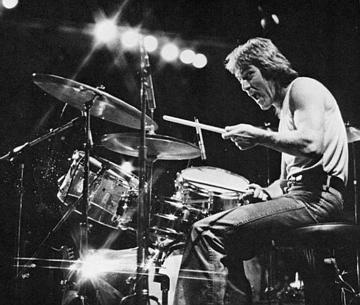 When Beachboys drummer Dennis Wilson died in 1984, his wife (against the Wilson family’s wishes) made a special request of then President Ronald Reagan. She said she wanted to fulfill Dennis’s wish of being buried at sea. Reagan obliged and arranged for the U.S. Coastguard to take care of it. It’s rare for someone who wasn’t in the military to get an official U.S. Navy burial at sea, but Dennis Wilson did. You don’t have to be famous or a Naval veteran to be buried at sea. It can be a bit complex but the practice is becoming more common. Mother Jones contributor Dave Gilson wrote a very informative article in 2011 about it that I will reference heavily. While burials at sea are gaining popularity, this is not something you want to take on by yourself. There are legal requirements and regulations you have to follow. Fortunately, some boat owners have incorporated burial at sea into their business and can guide you through the process. Gilson writes about Brad White, a 52-year-old licensed ship captain who has been depositing bodies in the Atlantic since 2005. His company, New England Burials at Sea, based in Scituate Harbor, Mass., does an average of six full-body burials a year and has 25 “pre-need” requests on file. He said it was in response to the increasing number of requests he’d been getting. He even handles full body pet burials. A guest at a sea burial signs a shroud before it is placed in the ocean. You can see the weights that will be used beside the deceased. Photo courtesy of New England Burials at Sea. White actually created his own biodegradable burial shroud. This harks back to the tradition of deceased British and American sailors who were wrapped in a sailcloth before burial at sea during the 18th and 19th centuries. Like they did, White uses weights as ballast to keep the body from floating back up to the surface. So how much does this cost? White’s full-body services start around $10,000 and go from there depending on what’s requested. You also have to notify the EPA within 30 days of the scheduled burial. There are regulations that specify exactly how far out you need to go and how deep the water has to be. Some states have different rules. You can learn more by reading Gilson’s detailed article. 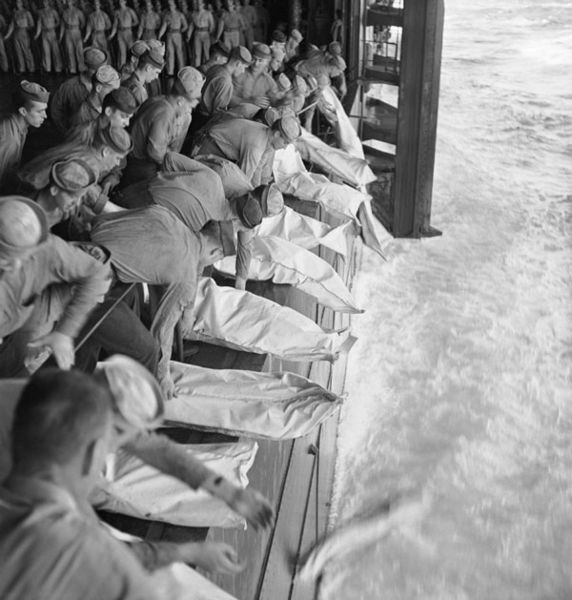 Burial at sea in 1944 for the officers and men of the USS Intrepid (CV-11) who lost their lives when the carrier was hit by Japanese bombs during operations in the Philippines. Photo courtesy of the Naval Photographic Center of the National Archives. The U.S. Navy refers to a body being buried at sea as “intact remains” and “casketed.” There’s a detailed process of whom they will bury and how they go about it. Norfolk, Va. and San Diego, Calif. are the only two ports of embarkation that handle this type of burial. Contrasted with White’s practices, the U.S. Navy places the embalmed (required) body into a metal casket (with holes drilled in it to let air/gasses to escape) that is weighted down. Unlike White’s smaller boats, which enable him to slide the body gently into the water, Navy ships are much higher up. According to Gilson, Bin Laden’s body reportedly fell from the hangar deck of the Vinson, which is about 55 feet above the waterline. Pallbearers for Cdr. Robert J. Sanderson (Ret.) 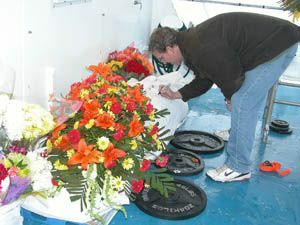 conduct a burial at sea ceremony in 2004. Photo courtesy of the U.S. Navy. Gilson points out the irony of the regulations involved. “The EPA will get on your case if you dump formaldehyde, a known carcinogen, into a stream or lake, but it won’t blink if you put a body filled with formaldehyde-based embalming fluid into the Pacific Ocean.” The EPA claims that because the ocean is so large, the chemicals are diluted and don’t have an impact on the ecosystem. I’m not so sure about that. Interest in “green funerals”has definitely skyrocketed in recent years. That’s a topic I’ll cover in the future. 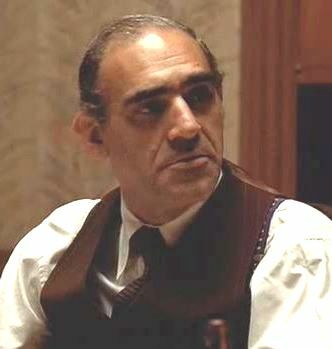 In the meantime, as you think about poor Luca Brasi, be comforted by the fact that the Corleones preferred their own family’s final resting place to be on dry land. 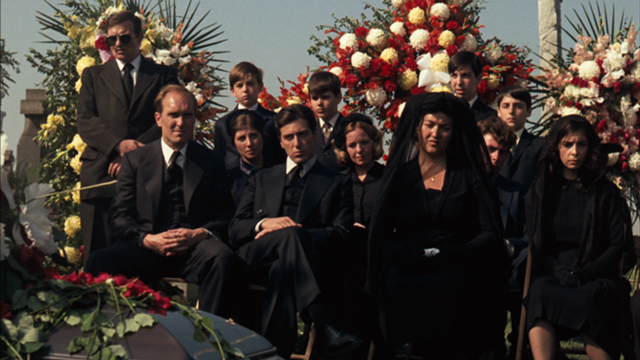 For The Godfather, Don Corleone’s funeral scene was filmed in Calvary Cemetery, Queens, New york.